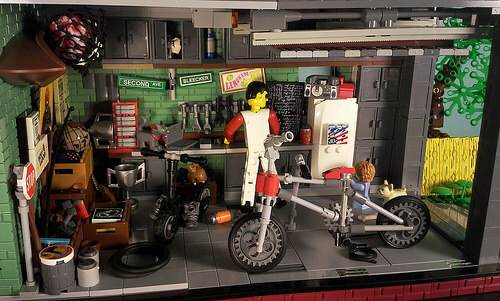 This vignette of dad’s busy garage by Mike M. is packed with the tools for all his fixin’ needs. The Technic figure scales nicely with some of the tools that are otherwise too big for minifigs to use. From buckets of paint to spare tires and cabinets full of gadgets and gizmos, dad is ready for a busy morning. Looks like junior came just in time to help!